A couple of weeks ago, I stopped in at Burger King in Medina to grab something to eat after bowling. I know the food is terrible for me, but I had a hankering for greasy, non-nutritious food. It happens. We all seem to fall for it. Considering Burger King alone makes $1.2 billion each year, and they’re not even the top earner, most of us like that food. Anyway, after I got my bill for a burger, fries, and a drink, I had an idea for an article. When we were kids, we were generally going to either of my grandmother’s houses in Lyndonville on a Saturday or Sunday. Our drive from Lockport took us through the bustling metropolis of Medina (I love Medina, especially Main Street) and past the one and only fast food joint in town. In those days it was McDonalds. 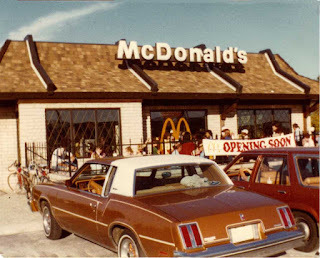 Every kid loved McDonalds when I was a kid. 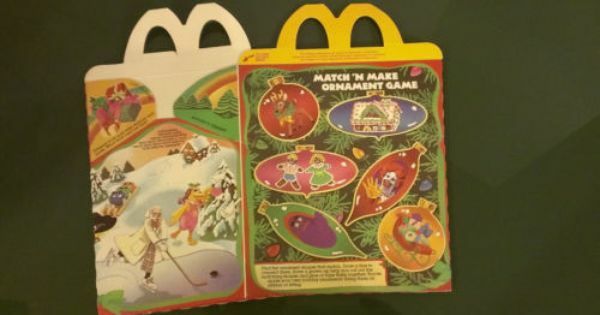 They had those cool Happy Meals with the equally cool toys. Okay, they were cheesy (pun intended) toys, but we loved them. Every Saturday morning the cartoons were flooded with commercials for McDonalds and Burger King. Flashy commercials with toys and clowns, kings, and whatever the heck Grimace was. Occasionally, we’d actually stop in for a Happy Meal. This was actually a rare occasional treat. We didn’t always have the money to go out to eat like that. I think it was $10 or $12 dollars for we kids to get our meals and toys, plus whatever my parents got. I think sometimes they went without so we could get our meals, but we were so engrossed with the puzzles on the box and the toys that we really didn’t notice. Let’s think about that for a moment. For $10-12, we got food for at least three of the kids. And we got toys that would occupy us while our parents were visiting their parents. Sure, it was the 1980s and things were different. It just seems strange that the food hasn’t gotten any better, the toys have gotten cheaper, but the prices have gone up dramatically. When I went to Burger King a few weeks ago, my meal consisted of a Double Bacon Cheeseburger off the “Value Menu,” small fries, and a medium drink. After tax, my bill came to just over $8. That’s for one person. If we took the whole family there (remember BK and McDonalds are billed as a family restaurant), our bill would be in excess of $50. For that same price (probably less) I could go to a local restaurant and get great food. Anyway, I’m getting a bit off topic. The coolest thing about stopping at McDonalds was the toys. They might be tops. They might even be Hot Wheels or Matchbox cars. Those were the best toys. 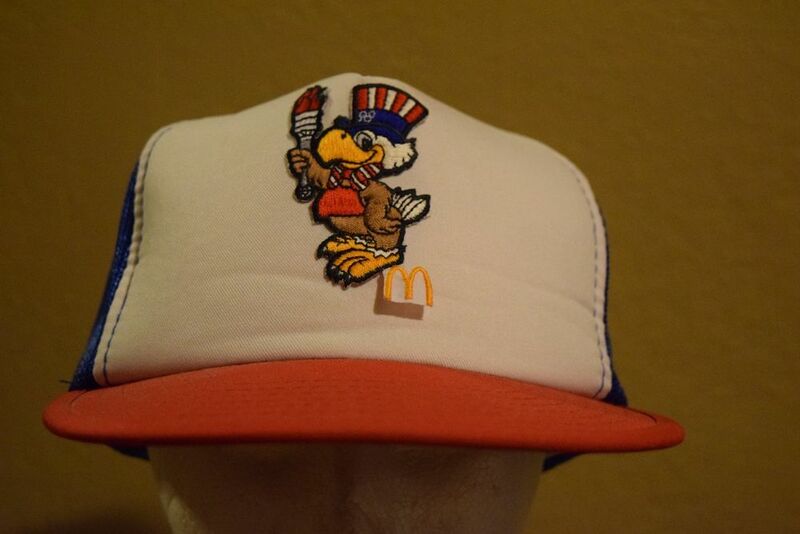 During the Olympics in 1984, we got great toys from McDonalds. I even got a hat. Everyone remembers that hat. There was a cartoon-styled eagle on it holding an Olympic torch. I may still have mine somewhere in all the crap I keep for no reason. One year, our Happy Meal came in a Halloween pail. I know my mom still has those. The Happy Meal boxes had games and puzzles on them, too. Today, it’s all about the movie tie-ins. Back in the 1980s, it was Ronald McDonald trying to outsmart the Hamburgler, and he needed our help! Or we had to connect the dots to find out what Grimace was missing. We had great fun once we were done eating, playing with the toys and the box the food came in. Luckily, my kids don’t really ever go to any of these fast food joints. Mostly this is because they are vegetarians, and it’s difficult to find something they can eat other than french fries. That would not be a healthy meal. When we do go out, it’s almost always to a locally owned establishment. Even when we go on vacation, we avoid the big box food outlets and ask for recommendations from the locals. Part of me is happy that they aren’t really interested in BK or McDonalds. Another part of me is sad. I’m sad because they don’t really know the thrills of getting a Happy Meal and opening it up to see which toy was included this time. Those were some fun days when we were kids. They came so infrequently, they were a real treat. After writing this, Craig Bacon wanted to go out for lunch. He was good, though, and had a sandwich at home.